My day job is working for my family’s construction company. I am the fourth generation to work in the company, and am very proud that we have been a part of building roads and bridges for over 85 years. Part of that history is the fact that the company has weathered a LOT of modernization over that time span. 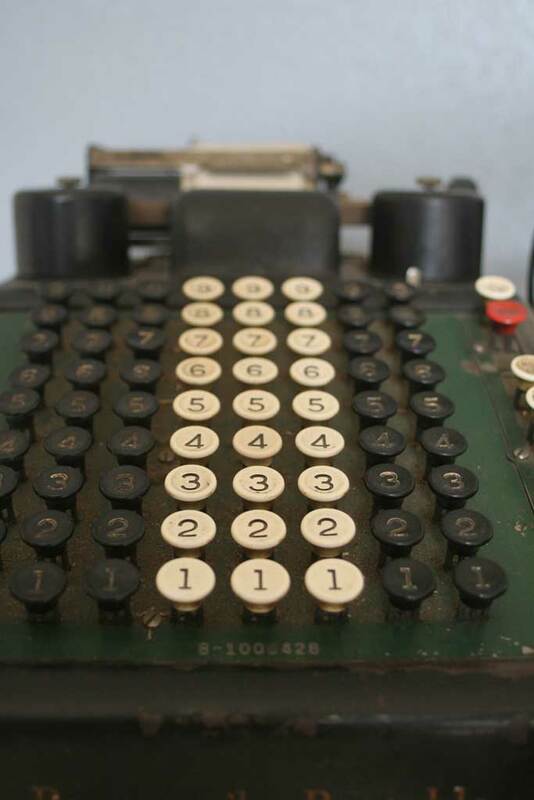 One of my favorite stories about the adaptation of ‘technology’ was when my great grandfather bought his first adding machine. He spent $750 and never trusted a number it spit out, double checking every number by hand, essentially doubling his work instead of making his life easier. And so it has lovingly been referred to as his $750 SOB. 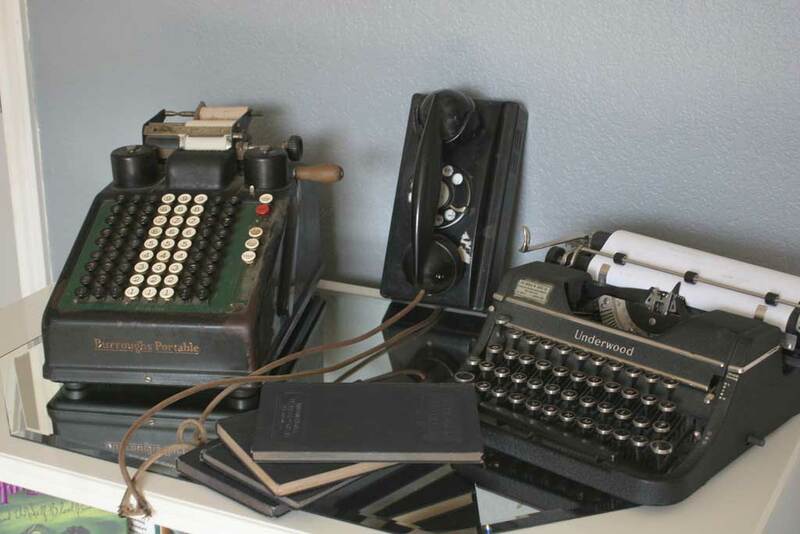 Although I don’t know the first thing about how to properly use an adding machine, I love having that little piece of history in my home. It felt like my office would be the perfect place to display this little piece of history. 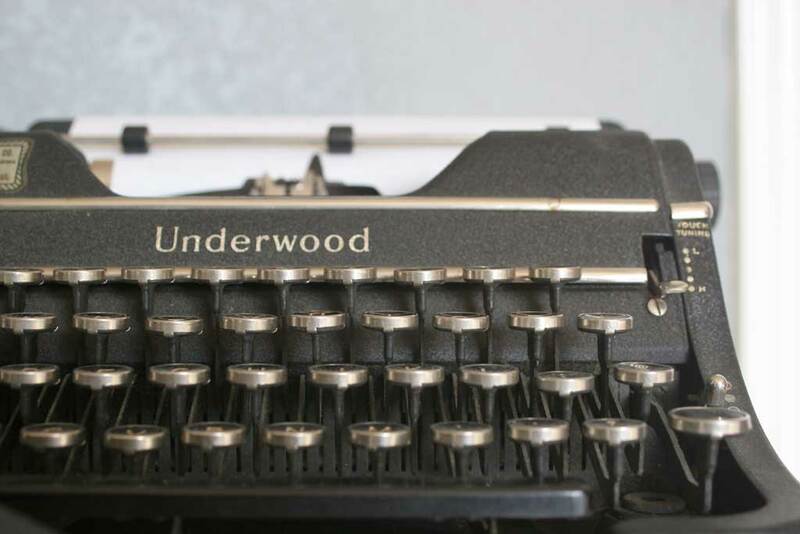 I paired it with an old typewriter that belonged to my grandmother (another basement find) and an old rotary phone. The typewriter is one my grandmother had in college and it was a big deal because it is a ‘traveling’ typewriter, complete with its own (VERY HEAVY) carrying case. I remember using these rotary phones at my grandmother’s when I was a kid. And funny story… a few years ago I was trying to fix a problem on her computer and called customer service on a phone like this. Remember when they used to say “Press 2 on your touch-tone phone” ? Well they don’t say that anymore because NOBODY HAS ROTARY PHONES ANYMORE, but those systems don’t work with rotary phones! I appreciated the irony of the fact that my 90+ year old grandmother has and operates a computer, but is still using a rotary phone well into the 21st century. I’ve got all these things displayed on a flat mirror laid over a bookshelf from Pottery Barn that is similar to this one (mine has a bookshelf instead of a top drawer). The mirror was a builder grade one I removed from the bathroom downstairs but liked the shape, so it fits nicely as a platform for these items! The other cool piece of history was a gift from one of my mother’s friends who found these books in an antique store. 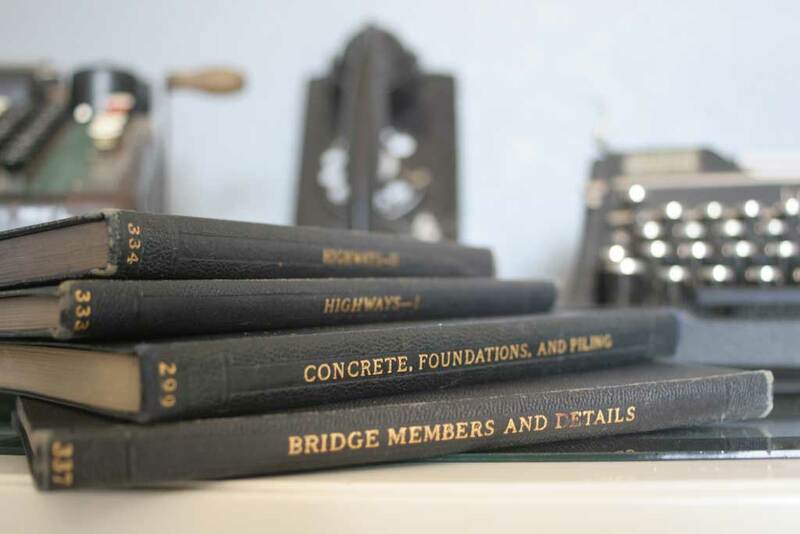 They are the specifications books for how to build a bridge from the 1920s. I love how they match up with the colors and the theme of this little display! Do you have an obsession with antiques too? I love these that have both meaning and significance to me!